At the beginning of 2000 Delphinio found a demo version of Warzone 2100 and eventually got the game. He started modding in 2003 with making maps for the GDT guild. His motivation was to play selfmade maps and breaking the monotony of Teamwar and New Teamwar maps. Due to a Warzone 2100 pause from autumn 2004 to autumn 2006 he forgot many things, but again started with mapping and was introduced to modding by Lordy, a warzone loyal Briton. Work on the NTW mod started in November 2006. Delphinio was inspired by the DM mod, which enthused him with the many changes it did to Warzone 2100. At the beginning NTW mod did not contain any changes to the technology tree, which changed with the addition of the T1 balancer, another mod by Delphinio. Kreuvf: What is the aim of NTW mod and to what extent has it been reached already? Delphinio: If I just knew that… . The actual aim was to create a mod that’s improving the balancing and makes Warzone 2100 nicer. Plus some special things such as new weapons. I already announced for several times that it’s done now and then again I found something new. At some point there won’t be any further updates, I just don’t know when this will be. Kreuvf: What was wrong about the balancing? And which new weapons are there? Delphinio: There are some issues in 1.10. You get lancer too early, which renders other weapons useless, e. g. the MG. The heavy laser and the plasma cannon as well as the super-heavy bodies were too heavy in my opinion. Then the pulse laser for VTOLs was overpowered. The Heavy Gauss Cannon is a plain extension to the Gauss Cannon. It’s got higher body points and does more damage, but is slower at reloading and costs more energy. As the super-heavy bodies are faster now and thus are more useful, you need something to tame them. The flashlight laser has been removed from the lasers, with the pulse laser being the new first laser now. It’s followed by the Twin Pulse Laser, Heavy Pulse Laser and the fresh, new, enhanced Plasma Cannon. And don’t forget the Hyperfire Laser. This is a laser which is firing like a machinegun and is preferably used against tanks. But don’t take too fat tanks… it may be heavy ones, but get out, if a Vengeance’s coming. You get Plasma Artillery when you’ve researched the Heavy Pulse Laser. It needs 1 – 2 shots to destroy an enemy structure. It’s comparable to the Condor Missile, but has a higher ROF. While the Condor Missile does more splash damage and is stronger per se. It comes before the Archangel Missile and has replaced the Angel Missile. But I’d build Plasma Artillery anyways, because it can attack targets which are farer away. The HV Cannon has been replaced by the Twin Heavy Cannon, because somehow you can never balance it right. It’s a stronger twin fire weapon, which of course comes with more body points and is heavier, does more damage and has a lower ROF. The Super Cannon (big twin fire weapon, in the cannon class) has got the same boni/mali except for the ROF, it’s the same. NTW mod also contains special thermal armour bodies: Fish, Dolphin, Whale and Chimpanzee, Baboon, Gorilla. The Fish class is cheaper, lighter (= faster) and has less kinetic armour than the Chimpanzee class bodies. The thermal armour is the same for both. The abbreviations „SE“ and „SA“ stand for „Special European“ and „Special African“. 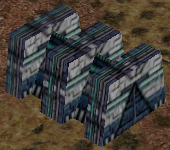 Turning to structures now: You can build scavenger structures and build some of their units. Not all scavenger structures are available, but the most common ones you know from the campaigns are. Kreuvf: Scavenger units? So you can also build these small foot soldiers, which run around and burn when hit by a flame thrower’s flame? How did you balance them? Delphinio: Yes, you can. Their balancing is comparable to the campaign. So they take very very few hits only. If you know Star Wars and the Empire, then you know what I mean when I say: „Quantity before quality.“ They may be produced fast with a single unit using only 4 – 15 energy. Most notably you can produce them right away as the HQ is only available from minute 6 on. This means that self-designed units cannot be used prior to the 7th minute. Concerning firepower they are okay, you just must not make the mistake and think that they can shoot while they’re moving, because they cannot do this. NTW mod not only has scavenger buildings and units, but at last also rudimentarily good shields. There are 2 kinds: One for VTOLs and one for ground units. Kreuvf: How do the shields look like, what do they do? Delphinio: I wished I could create real shields, but unfortunately that’s not yet possible. Both send out EMP shocks. Always to the nearest unit. Shields have quite long a range, which makes shields some kind of weapon. EMP Tank Traps work similarly, but they only shoot if you touch them. And they need much longer to reload. Maybe I’ll improve them. If you’re out of energy, the best is to build a Nuclear Reactor. : ) But please don’t forget to build cooling towers. There must be at least 2 of them and as close to the reactor as possible. The Laser Satellite has the 1.10 balancing and the Nuclear Missile Silo not that from 2.3 ; ). But it’s stronger with a 10 min reload time. Additionally there are 8 mines. Kreuvf: How do mines work in general? How do you mine? How do you disarm them? How can you see them? Delphinio: When a unit drives over it, it goes boom. Mines have no friend-foe-recognition. You can warn your alliance of mines using the Mines Sign. These are signs which can be placed before mines. Mines are built with trucks. Enemy mines are searched by the Cyborg Minesweeper, which automatically collects them, once it found some. It can remove own mines as well. Kreuvf: There is one NTW mod version for 1.10 and one for the recent WZP versions. Are there differences and, if so, which? Delphinio: I try to keep both versions the same, but of course that’s not always possible. There are not many differences. Essentially the 2.3 version contains both, mines and scavenger defensive structures in the technology tree, which is not possible in the 1.10 version due to internal limitations. The 1.10 version has a day night cycle which has been superseded by the skybox in the 2.3 version. The the 1.10 version uses Grim’s texture mod, which’ll be obsolete in 2.x soon. Kreuvf: How to give feedback to your mod? Delphinio: Well, register in the forum at http://www.warzone-2100.com/ and create a topic in the NTW area ^^ Or use the WZ2100.net forum. I also check if there are tickets in the bug tracking software of the developers for NTW, but recently there haven’t been any. This is a translation of the German original „Modder-Interview #2: NTW/Delphinio“. Falls nicht anders angebeben, ist dieses Werk unter einer Creative Commons-Lizenz (Namensnennung + Nicht kommerziell + Weitergabe unter gleichen Bedingungen) lizenziert.